A Glasgow teenager has launched a personal campaign to defy developers and save the historic site at Robroyston where William Wallace spent his final hours of freedom, before being captured prior to being taken to London, where he was brutally executed. Glen Wood, 13, of Garthamlock is worried about a well and nearby monument, which have fallen into a state of disrepair and are covered in graffiti. "I'm really interested in Scottish history, but we don’t get enough of it at school. I like visiting historic places but this one makes me sad. Not a lot of people know about it because there are no sign posts to mark it and those who do are disappointed because of how it looks. I thought if I did something to draw attention to it, I could get people talking and maybe something will be done. I think Wallace does deserve it." "Glen has now caught people’s attention and that can only be a good thing. Here's a young lad who is so passionate about his country – if only there were 1,000 more like him, it could make all the difference." Those photographs are shocking, an affront to the city of Glasgow and to Scotland, not to mention the memory of Wallace himself. What exactly do the councillors think they are up to letting this important monument fall into a state of permanent disrepair? Could it be something to do with the councillors being mostly Labour men, or are they just too busy filling in their expenses forms to bother doing their jobs? I've said it before and I'll say it here again, this only shames the memory of Scotland's son's and those who are responsible for cherishing that memory. The councillors should hang their heads in shame when it's left to the efforts of a wee lad, Glen, to draw our attention to something as important to Glasgow as Wallace's Well and Memorial. Thank goodness the people of Stirling have more about them. You know it really shames us that this kind of thing (and not for the first time) happens in Scotland. When you travel around the United Kingdom and Ireland, as well as abroad, this doesn't seem to happen to monuments or what are considered to be memorable or sacred places. I wonder if this is a cultural thing too. However, quite regardless of what's caused it, Councillors should indeed hang their heads in shame and get this place properly cleaned up. Poor wee laddie having to take this on, it's so disgraceful and sad. I quite agree with Glen about the fact that this memorial should be saved and cleaned up . I have also said on these boards before ,that not enough Scottish history is taught in schools . We have told our children some of Scotlands history ,although we dont know it all ourselves sadly . I remember being taught about Scotland and Glasgow's history at school on a regular basis , sadly thats not the case nowadays. Councillors dont care about important matters , their too busy working out ways to line their pockets . Hope this wee boy gets support , and puts the council to shame over their laziness and lack of respect for William Wallace , one of Scotlands history making heroes. Please support Glen and this cause we need everyones help with this. Please leave a comment on the news site here. It is refreshing to see a young man with an interest other than rap music and sport but it strikes me that if young Glen were really interested in the state of the monument to his hero he would be better off getting into a pair of overalls and gloves and doing a bit of a clean up on his own. This would probably generate more and better publicity for his cause than posing in a kilt and a ghillie shirt. So, not enough Scottish history is taught in schools? How much is "enough"? It is pointless to teach Scottish history unless it is taught in the context of wider European and world history. I have read all this with interest as I had never heard of either Wallace's Well or the monument before although I lived for over 30 years in Scotland, 20 of them in Glasgow. I was always aware of the memorial in Elderslie, the place of his birth. Why is it the responsibility of the City Council to keep this area clean, surely the Wallace Society should take on this task. I am surprised at this child's comment that he doesn't get taught Scottish history in school. When I was in school, albeit a long time ago, we were taught nothing but Scottish history and then in High School British history and then European from 1603 onwards, it may be different now. He didn't say that he never got taught Scottish history, but that's only happened lately. The Society of William Wallace have been fighting this cause for years to this day, with very little help from Glasgow City Council who have been passing the buck as you can see in the commemt below. If a teacher didn't know of these sites what chance do the kids have. About 15 years ago, when I was a teacher in Milton, we were doing a topic on Wallace and Bruce. I was told about this site by a pupil who lived in Wallacewell Road. I visited the site myself as I had never heard of it and couldn't really believe that it existed. I asked many of my friends and colleagues at the time if they knew of this monument and only one was aware of its existence. I then took the class to visit and explained its significance. 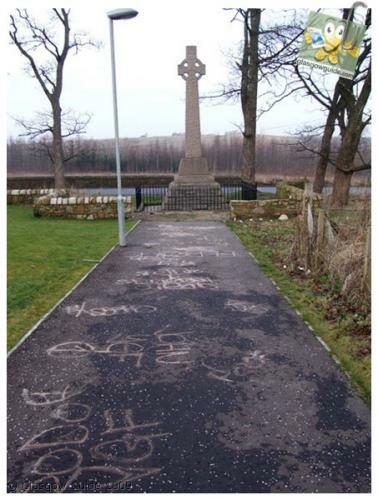 As part of our project, my P7 class wrote to Glasgow City Council asking why this important site was not being advertised as a tourist attraction, especially with the impact of Braveheart at the time. We also pointed out the mess of the area, the lack of road signs and parking access. We got a reply stating that there was nothing they could do as the site was on private land and suggested we get in touch with the Wallace Society. In other words they have known for some time about this problem and I am so pleased that someone has brought this disgraceful neglect to a wider audience. Good luck!! So why don't the Wallace Society organize a clean-up. If the monument is on private land then the Council have no jurisdiction over it and should not be held liable for the ongoing mess. The Wallace Society are always cleaning it up as have Wallacewell school, but there's only so much one can do, and there's more to it then just cleaning up. Yes they said private land to that lady, they also said this in the paper. While we were at the Wallace Well Primary School, a lady who works for Asda came over to see how the school’s open day was going. She told us a wee story of the difficulty that she’d been having trying to find the person in charge at Glasgow City Council who was responsible for cleaning the monument here at Robroyston.As you may or may not know the monument was paid for by public subscription in 1900 and the Council basically agreed that they would clean it up now and again. Some of the staff at Asda offered to volunteer to clean the Monument as Glasgow City Council had been letting things slip lately. Asda thought this was a great idea but reckoned that they should get permission from the Council so as not to step on anyone’s toes. After several phone calls the lady in question finally got through to someone who it seemed was responsible for the monument. Personally I think you’d be seen as a Patriot first and foremost. Hi. Glad to see your website is highlighting what amounts to a national disgrace. 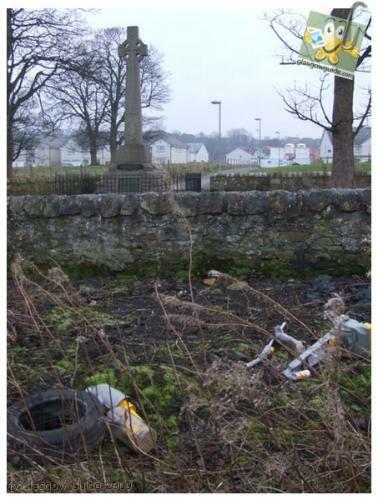 As Vice Convenor of the Society of William Wallace, I host the annual commemoration at Robroyston and am dismayed that each year the site seems to deteriorate further. I have been writing to Glasgow City Council and Historic Scotland for over 10 years asking for improvements only for my words to fall on deaf ears. 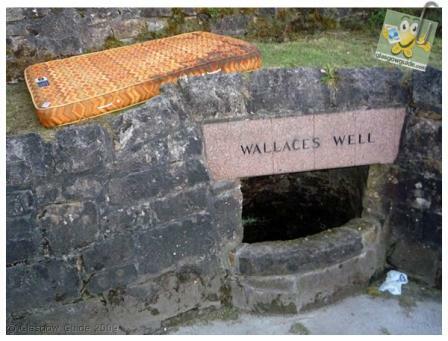 I have also been calling for the de-listing of Wallace’s Well to be reversed, but they stubbornly refuse. In one reply a few years ago, they told me the structure was “too modern”, but that same year afforded protection status to the brick-built Robot Bookie in Lanark racecourse ( built 1929) and the Seamen’s Mission ( built 1928) !! We will continue to bring this to the attention of MSP’s and the press. All the best with the website. I would like to know what the money was spent on as I go to the monument every time I visit my daughter in Robroyston. The only difference I can see between last September and June this year is the removal of a piece of yellow plastic fencing which was left by builders of the nearby houses. 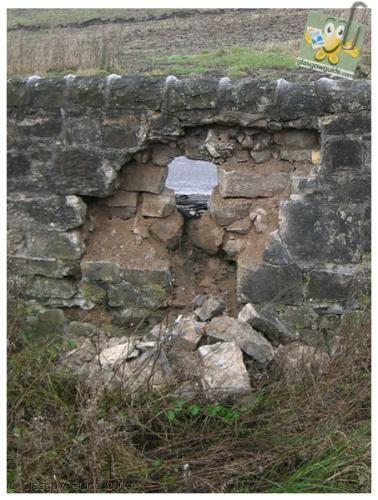 The paving slabs are still broken, the wall is falling down in places. 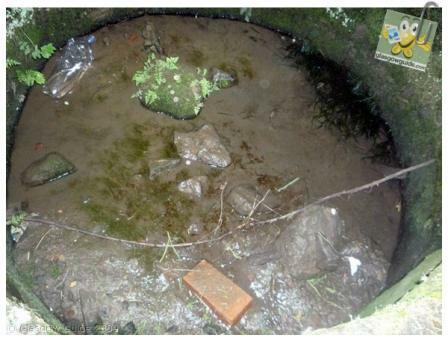 The well is still full of rubbish and the surrounding area is overgrown with weeds. It has been like this for years despite numerous people writing to the council and newspapers bringing it to the attention of readers. I'm at a loss to know what the answer is to this national disgrace as no-one will take responsibility for the upkeep of these two historic sites. Like many others, I will continue to write to the council but I doubt if anyone actually reads the letters as I have never had an acknowledgement from them.